Selected by the Lakers in the second round (32nd overall) of the 2016 NBA Draft. Played five games with Cibona in the Adriatic League for the first part of the 2015-16 season, averaging 6.8 points, 3.0 rebounds, and 1.2 blocks in 13.0 minutes per game while shooting 57.7% from the field … In two FIBA Euro Cup contests with Cibona, posted averages of 12.0 points and 6.0 rebounds … Terminated his contract with Cibona and eventually landed with Mega Leks … In 13 Serbian League games with Mega Leks, averaged 10.9 points and 5.1 rebounds as the team made the league semi-finals … Was unable to play for Mega Leks in the Adriatic League because of the league’s transfer regulations, and decided to declare for the 2016 NBA Draft as an early entry candidate ... Helped the Croatian U-19 team capture the silver medal at the 2015 World Championships, finishing third in the tournament in scoring at 17.9 points per game and seventh in rebounding (7.9) … Following the U-19 competition, participated with the Croatian U-18 team at the 2015 European Championships, leading the tournament in rebounds per game (12.9), blocks (3.0), and double-doubles (six), and finished eighth in scoring (15.8) … Named to the U-18 All-Tournament Second Team … Also represented Croatia at the U-16 European Championship in 2013. 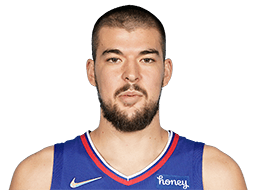 One of a record-setting 26 international players drafted in 2016, including a record-tying 12 taken in the second round … Name pronounced EE-vits-uh ZOO-bahtz … Born in Mostar, Bosnia & Herzegovina, but is a naturalized Croatian … Cousin is Zoran Planinic, who played in the NBA for the New Jersey Nets from 2003-06 ... Participated in the Lakers Team Up Event in August of 2016, organizing food boxes to give away at the L.A. Regional Food Bank.